In The Colorado Doctrine, David investigates the historical development of the prior appropriation doctrine of water rights, commonly associated with the western states of America. The traditional view of the evolution of this doctrine is that the riparian rights doctrine of the eastern states, which entitles all landowners along a river to reasonable use of the water, was unsuited to the arid climate of the west. Therefore, a “first in time, first in right” system of water rights was created under which rights are obtained through use and earlier users are preferred to those coming later. The water rights are severable from landownership and transferable. For some law and economics scholars, the evolution of the prior appropriation doctrine is explained due to the high value of water in the dry climate and the necessity of a private property regime to ensure maximum utilisation of this valuable natural resource. As a result, the history of prior appropriation is often used as evidence of the superiority of private property over a common property regime for scarce resources. David challenges this traditional view by digging deep into archival material from the mid to late 19th century in Colorado. Using this material, he shows that the ideology prevalent in 19th century western America was stanchly set against speculation and corporate ownership. The development of prior appropriation, where water rights are restricted by actual use and made transferable was, David argues, motivated by principles of distributive justice rather than economic efficiency and wealth maximisation. Due to this finding, David argues that property regimes are often more nuanced and complicated than a strict distinction between private property and commons. He shows that the prior appropriation theory in Colorado grew from a system of public property and provided private rights to water which were transferrable in order to try and ensure as wide a distribution of rights among actual users as possible. The findings contained in The Colorado Doctrine have interesting parallels in Scotland. 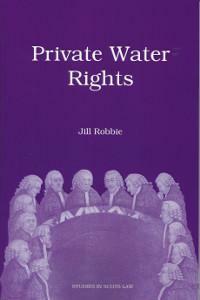 The water rights regime in Scotland developed between the mid 17th and mid 18th centuries. Advocate, judge and jurist, Lord Kames was at the centre of this development and established the theory that as water is among the res communes, or communal things, it is outwith ownership and open to all humankind. Everyone has a right to appropriate a portion of water. If a landowner diverted a river, this would be depriving those downstream of their public right to appropriate the water and landowners were therefore prohibited from diverting the rivers running through their lands. This obligation on landowners was then developed by the courts into a correlative right held by landowners against any interference with the flow of a river. Landowners are allowed to take water for primary purposes, such as drinking, washing and cooking, but no other interference with the material flow is allowed. David’s argument regarding the inaccuracy of a strict divide between common and private property regimes is therefore demonstrated by the Scottish regime which derives from a system of commons but with the result that no one is entitled to use water for secondary purposes, such as agricultural or industrial purposes, unless they obtain agreement from the landowners along a river or they are in the position of having a river wholly contained within their own land. Further, in Scotland, the appropriative rights of landowners were curbed in order to protect water for drinking and washing. In developing this restrictive system, the courts at the time were influenced by the social injustices caused by the Industrial Revolution. Following the migration of people from the countryside to the cities, there was a desperate need for public water supply but the water available was often insufficient and polluted. Many of the new industries in Britain consumed water or left water highly polluted, leaving little clean water remaining for the general population. Lack of clean water was identified as the chief cause of diseases like cholera, typhus and tuberculosis that were rampant across Britain. It was in this context that the right to natural flow developed and that preserving the use of water for domestic purposes might be at the expense of industry seemed acceptable. Lord Swinton in Russell v Haig said that “since there are evils, we should admit those only which are necessary: dwelling houses cannot be avoided, but manufactures may…” The argument that manufacturing would be significantly affected if the law developed in this way fell on deaf ears in the courts. In Hamilton v Edington & Co it was stated that manufactures “will not be injured by this doctrine, because there is little danger that consent will be refused where an adequate consideration is offered…” Thus, if anyone wished to use water for secondary purposes, the rights would have to be purchased from their neighbours. This incredibly restrictive system of water rights therefore created a barrier to economic development in the interests of social justice. For the full post and citations, see here. For more on social justice in Scottish environmental history, see here.